Last night, NASA reached out one final time to the Opportunity rover on Mars, hoping the golf-cart-sized machine would phone home with good news. Since June, the robot has been unresponsive, likely because a planet-wide sandstorm coated its solar panels in dust. NASA has pinged it over 1,000 times in those gloomy eight months, to no avail. Last night’s attempt was no exception: NASA has announced that Opportunity is officially dead. So yes, Opportunity is technically dead. But perhaps it’s more accurate to say it’s bravely completed its mission—and then some. It was only expected to scoot about the martian surface for three months, yet here we are 15 years later. It was designed to travel just 1,100 yards, yet ended up roving a stunning 28 miles. With its companion rover Spirit, the two robots studied the hell out of the Red Planet, exploring geology and dust devils and even finding meteorites. Callas also offered insights into why Opportunity couldn’t recover from June’s historic global dust storm. The lack of light meant its battery couldn’t charge. But in an ironic turn of events, it may have been a clever emergency workaround in the rover’s early days that ended up sealing its fate 15 years later. A visualization of just how bad the historic dust storm was. At left is normal Mars weather, at middle are other dust storms Opportunity had weathered, and at right is the almost total darkness of the storm that felled the rover. 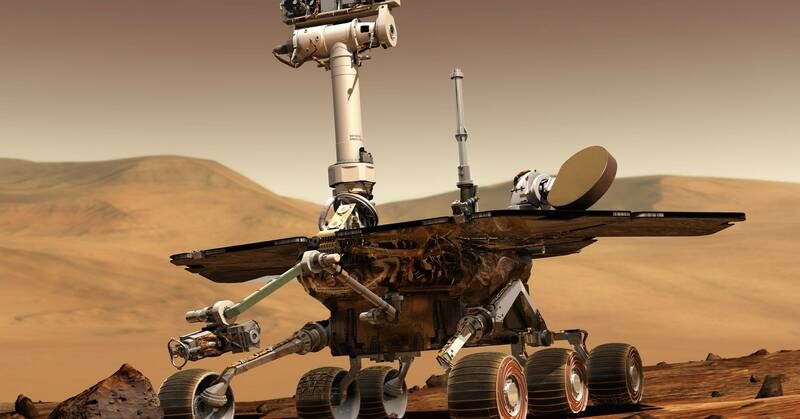 After Opportunity landed, in 2004, engineers realized that a heater in its robotic arm was stuck in the on position. The solution was to shut everything down each night, which allowed the rover to stay just warm enough to survive until the sun came up in the morning. Opportunity’s long-delayed retirement, though, is nowhere near the end of Mars science. In November, the InSight lander touched down on the planet’s surface. Its mission? Sit in place and deploy a range of instruments that will help reveal the geological secrets of Mars. Nor is it the end of Mars rovers: Curiosity is still truckin’, exploring the planet’s geology and taking lovely selfies. (It is nuclear-powered, by the way, which makes it more tolerant of the vagaries of Mars’ weather.) And the Mars 2020 rover will soon land on the Red Planet, setting the stage for human exploration. It’ll probe for signs of erstwhile microbial life, test a method for producing oxygen from Mars’ less-than-breathable air, and study surface conditions, so future human explorers don’t run into any surprises. NASA has learned so much about Mars from Opportunity, but it has also learned about Opportunity from Opportunity. Every success, like a rover tackling different terrain, teaches engineers about planetary robotics, as does every failure, like Spirit’s retirement after getting stuck in soft soil. Opportunity’s and Spirit’s meanderings will inform how the next Mars rovers are designed and how any number of other robots might one day walk and roll and fly alongside humans on Mars. So thank you, Opportunity, for your service. May you rest peacefully in the dust.